Ranked outside the top-200, Tsonga returned to Montpellier to conquer the 17th ATP title and the first since Antwerp in 2017, defeating the 7th seed Pierre-Hugues Herbert 6-4, 6-2 in an hour and 13 minutes to become the seventh French victor of this event in nine years. Herbert has now lost his three singles finals on the ATP Tour. 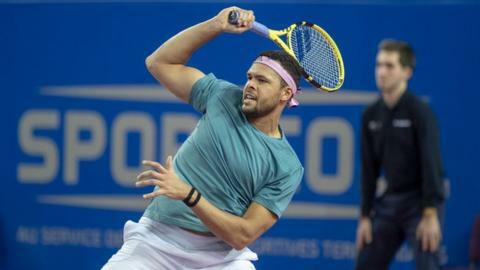 France's Jo-Wilfried Tsonga in action during the match against Serbia's Novak Djokovic. Cuevas, who earlier swept aside Aljaz Bedene in their weather-delayed quarter-final, took the second set but Pella produced a lethal forehand to advance to his fourth ATP Tour final 6-1 3-6 6-3. In the other semifinal, Bulgaria's Marton Fucsovics rallied to beat Italy's Matteo Berrettini 5-7, 7-5, 6-3 in 2 hours, 13 minutes.